Read the “Collection of Learning Evidence” from Chapter One: Textbook for ideas of items to add to your list that is posted below. What following sections will you include in your collection of learning evidence? an action plan to accomplish your goals. Design. Laurence G. Boldt. (1999). Penguin Putnam, Inc.: New York, New York. evidence stored in your reflective portfolio. Store copies of your resume as it evolves. This helps you understand your progress. Use your college career center for advice on resume design. yourself and for marketing your talents. Don’t undervalue your experience. Remember, you can think about your experience as transferable skill experience. profile statement that introduces you in the first item of your resume. For each entry on your resume, provide evidence in your Best of Show Portfolio. Consider posting your resume to your school Job-Track Site or their equivalent site. Career-Hunting; consult the section entitled The Resume. can provide an academic road map for you to follow your passions. Get a copy of your official transcript for your reflective portfolio. applying for graduate school, is a great source for transferable skills. Learning Experience to assist in this section of your portfolio. Include your work in your General Education Courses. Include your work in your Elective Courses. Include your work in Internships and Coop Programs. Include your work in Study Abroad Program. others, and for use in graduate school to underscore your range of study. your narrative of your work experience if you don’t have written samples.  Include Military Service, Employment, and Entrepreneurial Experiences. individually? What was done within groups? deadlines? Track your decisions and concrete samples of the resulting work. letter request regarding your interview. community service experience, and military experience. A person writes a letter of reference that honors your character and skills. persuading others, so get those reference letters! The letters are great for you to read so you can honor your accomplishments! When you need letters of recommendation, these same people are a great resource.  Ask for your reference letters today. People sometimes take a while to produce them. address such as character, results of a project, and your skills. probably won’t remember what was written since you wrote the letter! lost. Testimony is great for establishing and supporting your credibility. degrees. If you don’t have many, then make a plan to get some.  Your Honors: Collect letters from Scholarships, President’s List, Dean’s List, etc. and career for assuring a sustainable world? the Website from the Center for Democracy and Citizenship from the Hubert H.
further training. Most colleges have a wide array of non-credit training in this area. center. Collect as much information on interviewing skills as possible. Organizational Skills: Analyze your personal, work, and time management skills. 2.1 Putting Your Organizational Skills to Work for You. Technology Skills: Collect samples of your accomplishments using technology. credit training that is offered. Show evidence of your willingness to learn technology. Remember that technology is the new literacy we all need to develop with it! Consider making an electronic portfolio or CD/DVD for your Best of Show Portfolio. Student, Faculty, and Institutional Learning. chapter in life as citizen and professional. Skills, Public Speaking Survival Kit, and Leadership in the New Millennium. connection between your decisional style and types of careers best suited for you. develop connections in your community. Make a concrete plan to explore! Make time to discover your new interests. to explore new options career wise and educationally. study? For career development, personal development, or just plain fun? Congratulations! 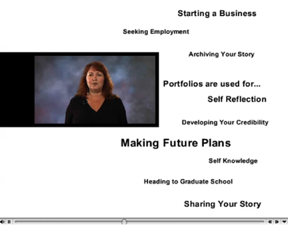 You are now on the road to maintaining your Reflective Portfolio! View Your Expertise Development in your Major. and Best of Show-Public Portfolio, which you will be in the next chapter.